Tariff barriers will not be removed on certain agricultural products, for example, dairy, poultry and eggs, although there does not appear to be mention of pork. 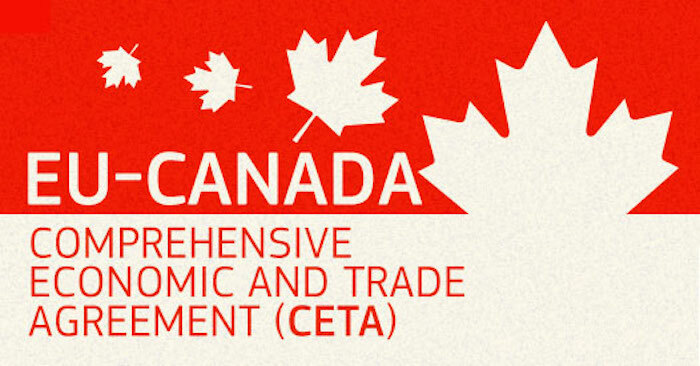 Canada will eliminate duties worth €400 million for goods originating in the EU on the first day of its implementation, according to the Commission. Brussels insisted the deal created ‘new opportunities for farmers and food producers, while fully protecting the sensitivities of the EU’. It said the EU’s openings on certain products are ‘limited and calibrated and are balanced out by Canadian openings that satisfy important European exporting interests’. Canada has agreed to protect 143 ‘distinctive’ agricultural food and drink products from specific geographical regions in the EU, ranging from Roquefort cheese, to balsamic vinegar from Modena and Dutch Gouda cheese. They will be protected from imitations at a level comparable to EU law and will avoid the risk of being considered generic in Canada. But in its response to the deal, the Commission has repeatedly to reassure the EU food sector and consumers that the deal will not pave the way for lower standard imports, a major concern for the pig sector, not just here, but as the UK seeks to forge new post-Brexit trade deals. It added: “Free trade does not mean lowering or changing EU standards that protect people’s health and safety, social rights, their rights as consumers or the environment. The deal was approved by 408 votes to 254, with 33 abstentions in the European Parliament in Strasbourg. “By adopting CETA, we chose openness and growth and high standards over protectionism and stagnation,” Parliament’s rapporteur for the CETA agreement Artis Pabriks (EPP, LV) said.